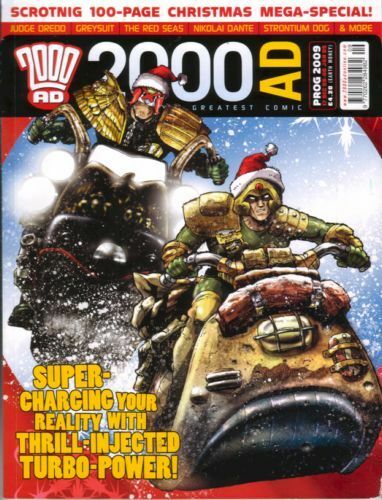 by Various The Galaxy's Greatest Comic celebrates the festive season with its end-of-year spectacular - a 100-page issue featuring all-new stories by a host of great writers and artists! Future lawman Judge Dredd comes down hard on the gender war in 'One For the Boys' by John Wagner (A History of Violence) and Henry Flint (The Haunted Tank); super-powered secret agent John Blake has revenge on his mind in Greysuit: 'The Old Man of the Mountains' by Pat Mills (Marshal Law) and John Higgins (Hellblazer); bounty hunter Johnny Alpha demands vengeance on a fellow mutant in Strontium Dog: 'Blood Moon' by John Wagner and Carlos Ezquerra (Bloody Mary); Nikolai Dante is a hunted man, courtesy of Robbie Morrison and John Burns; the law on the streets of Mega-City One has a new face in 'Marauder' by Robbie Morrison and Richard Elson (Kingdom); and there's more pirate mayhem in 'The Red Seas' by Ian Edginton and Steve Yeowell (The Invisibles). All this and much more!